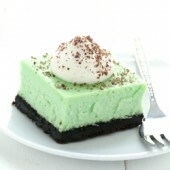 Creamy mint cheesecakes with a rich chocolate crust and homemade sweetened whipped cream! 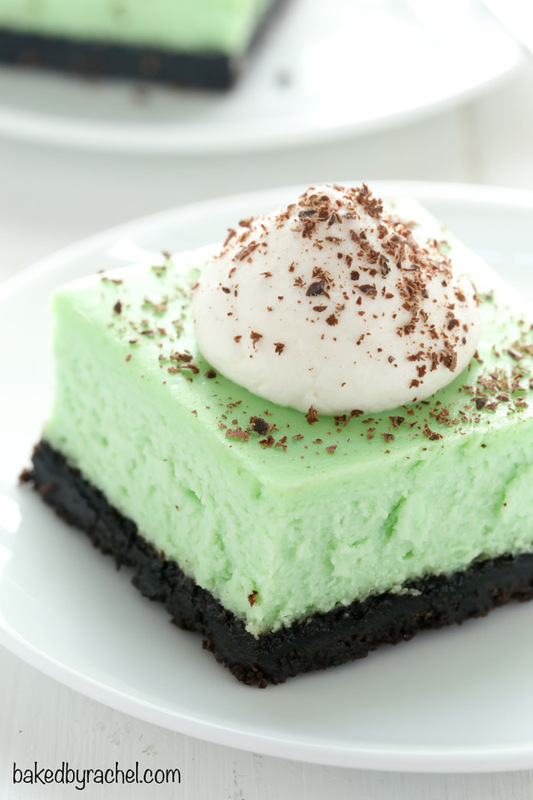 A festive dessert for St. Patrick’s day festivities or any day! We had the most bizarre school vacation week. Are you ready for this? There was no fighting. Cleaning was done with minimal whining. And the kids all gleefully helped prepare the meals. And making it even more amazing and strange, the kids got to play outside without jackets… in February… in New England. Crazy! I’m not complaining, seriously. I fully enjoyed our totally lazy week off together. Normally I’d keep on working even though they’re home, especially if we didn’t have anything planned. But I decided to do as little as possible. It was a nice break. I did make these cheesecake bars though, and a few other goodies you’ll see soon. But beyond that, it was one of those super relaxing weeks where we played and binged on…wait for it… Gilmore Girls. Yup, my oldest is hooked. We’ve moved on to the college years. So much better than the earlier years. And in case you were wondering, we still haven’t made our gingerbread house. We’re considering doing it this week. It’s at least on the brain, but if we don’t get to it, or we forget about it again, no biggie. Also, I’ve begun searching sandals online. I don’t need any, but that may not stop me from getting a new pair. The kids on the other hand will most definitely need new ones with how fast they grow. I’m living vicariously through them while picking out cute options for consideration later. Itching for the Spring and Summer weather to get here and stick around for good. It sure seems like it’s on the horizon but I don’t want to jinx it. I love making fun seasonal goodies. Special holiday treats even. 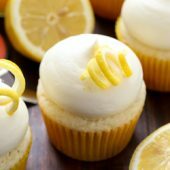 In the past, I’ve whipped up boozy treats for St. Patrick’s Day from super moist and amazing Guinness chocolate cupcakes to Bailey’s chocolate cheesecakes and even Bailey’s chocolate pudding but this year I went a different direction. I’m not promising boozy food won’t show up in the next few weeks, but for now… we’re doing the green minty thing. Super easy, creamy mint cheesecake bars with a rich chocolate crust and homemade whipped cream with chocolate shavings! These were a huge hit with the entire family. I’m positive they’ll be a huge hit with your family too. So, be sure to add these ridiculously tasty and festive mint chocolate cheesecake bars to your dessert plans! 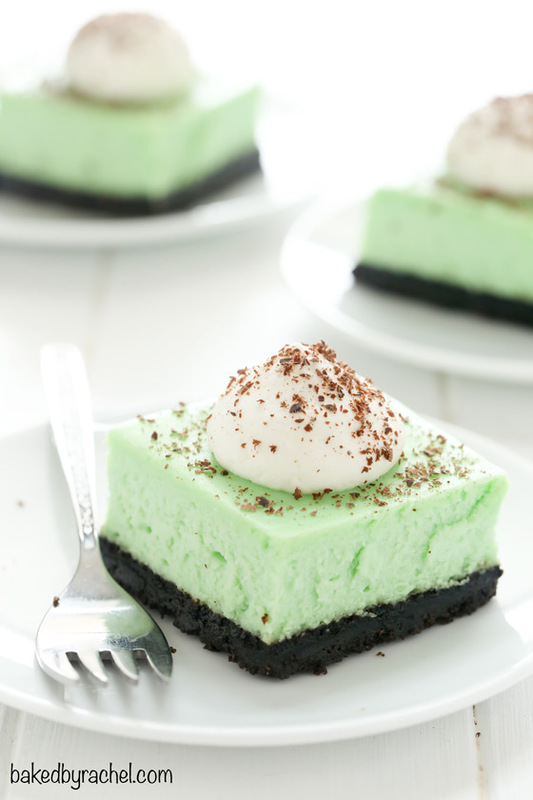 Creamy mint cheesecakes with a rich chocolate crust and homemade sweetened whipped cream! A festive dessert for St. Patrick's day festivities or any day! Preheat oven to 325°F. Line an 8x8 baking pan with parchment, leaving overhang on at least two sides. If necessary, binder clips may be used to hold the parchment in place. In a food processor, blend cookies until only fine crumbs remain. 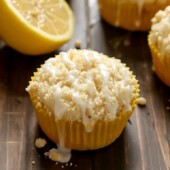 Add butter and blend until fully combined and all crumbs are moist. 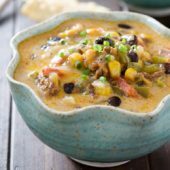 Press into the bottom of the prepared pan, creating an even layer. Bake for 10 minutes. 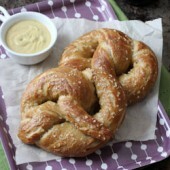 In large bowl or stand mixer, beat cream cheese until smooth and fluffy. 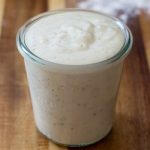 With mixer running on low, slowly add sugar. 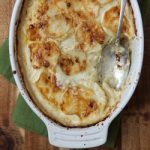 Mix in sour cream, followed by eggs. Mix fully between each addition. Add extract and optional gel food color. Mix until just combined and all batter is tinted. Scrape bowl to be sure all batter is equally tinted and mixed well. Pour batter into prepared pan. If necessary, level off with an offset spatula. Bake for 40-45 minutes or until only the center is jiggly. Cool to room temperature on a wire rack, then transfer to the refrigerator to chill overnight. 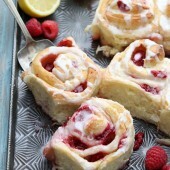 In a medium bowl, beat together powdered sugar and heavy cream until stiff peaks form. Chill until ready to use. Carefully remove cheesecake from pan, pulling up and outward on the parchment paper. Cut into desired sizes. Add a dollop of whipped cream and optional chocolate shavings prior to serving. Store remaining cheesecakes in the refrigerator. 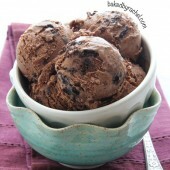 *20 Original chocolate Oreo cookies with filling will yield 1 1/2 cups crumbs. Do not use Double Stuf Oreos for this recipe. I’m glad to hear you had an enjoyable school vacation week! 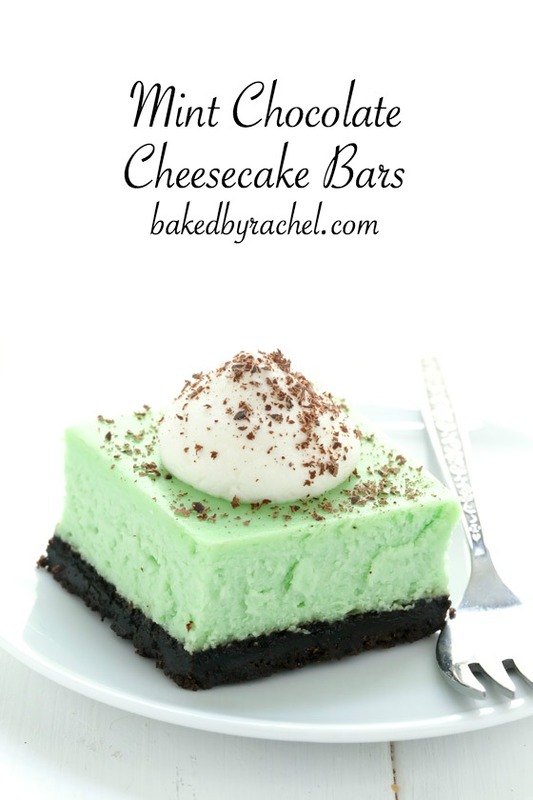 I love that you shared these mint chocolate cheesecake bars with us. Not only is the color fun but I love the combination of mint and chocolate! YASSSS YASSSS YASSS to binge watching the Gilmore Girls – confession time, my daughter and I went out and bought the whole entire series on DVD before it was available on NetFlix and we have watched the whole thing twice – isn’t it exciting that there will be a new season!? That’s exactly why I’m rewatching it. Definitely looking forward to the mini season when it is finally available! And thank you! I’m still crossing my fingers I get to see a gingerbread house. An Easter one would be epic, peeps instead of gingerbread men! Cheesecake bars are the best, so much easier than a regular cheesecake. Love this mint chocolate flavor for St. Patty’s Day! Haha well… hopefully we’ll get around to it putting it together sometime soon! :) And thank you! What a pretty shade of green! I have some friends who would LOVE this! It’s perfect for St. Patricks Day coming up too! Binder clips to hold the parchment…brilliant! I’m glad you like the tip! And it really does work beautifully! I love making seasonal desserts too, this one is so perfect for St. Patrick’s Day! It looks delicious! What a yummy Saint Patrick’s Day treat! 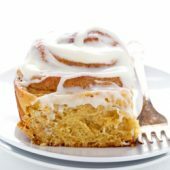 Can this be baked in a regular springform pan?